Supplying hamburger buns for the fast food giant McDonalds, the Turano Bakery facility in Orlando, FL must run an exceptional operation in order to bake a quality and consistent product that billions have come to expect. For nearly half a century, the Turano family has followed European traditions to bake the freshest, highest quality artisan-style breads such as Ciabatta, Focaccia, Hearth-baked Peasant breads, and a variety of rolls. Sharing a favorite family recipe from past generations, they use authentic time honored techniques to ensure exceptional old world flavor in each and every bite. Their extensive line of specialty breads and rolls are delivered fresh daily throughout the Chicagoland area. In addition, Turano Breads can be found across the United States on a frozen basis through food distributors and top national restaurant chains. The bakery’s state-of-the-art facility, equipped with an automated inspection system and wireless data communications program that allows plant management to adjust the operation as needed, even from home, give Turano the ability to produce approximately 1,100 soft buns a minute, which are then distributed to nearly a thousand McDonalds in the southeast. With such high expectations, there’s no room for error or downtime, even when it comes to maintenance. 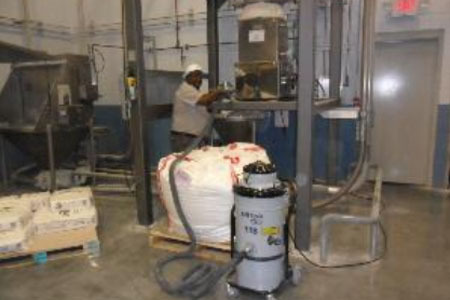 According to Jeff Benny, Sanitation Manager, Turano Bakery initially used shop-style vacuums for general cleaning of excess flour that decorates virtually any size baking operation. Unfortunately, these low-cost commercial vacuums frequently overheated, sparked, and broke down, resulting in workers having to take more trips to the dumpster than cleaning their 100,000 sq. ft. facility. In fact, Jeff estimates they went through 6 to 10 shop-style vacuums in a 1 year period alone.